Fiona Connor, Closed Down Clubs (2018) (installation view). Image courtesy of the artist and MAK Center. Photo: Esteban Schimpf. Beyond mere entry and exit, not much thought is given to the doors through which we pass every day. Closed Down Clubs, New Zealand-born, Los Angeles-based artist Fiona Connor’s latest exhibition, invited contemplation of the larger significations of such mundane portals. Housed at the MAK Center’s Mackey Garage Top (a sleek and airy space above a garage behind a Rudolf Schindler house), Connor’s exhibition was comprised of nine freestanding doors installed in a staggered, parallel formation, each emblazoned with printed or hand-written signs announcing the recent closure of the businesses to which they were once attached. Like virtually all of Connor’s work, each of the sculptures included is a meticulous replication of an actual object. Having previously assumed such forms as bulletin boards, drinking fountains, and architectural infrastructure, her works are typically adorned with artist-drawn or screen-printed stickers, posters, or pamphlets to faithfully match the original reference as closely as possible. As relics of shared space, her works often bear traces of obsolescence or fatigue, expounded through the artist’s fastidious duplication of objects’ apparent wear or corrosion. Closed Down Clubs was no exception—one could sense the traffic that Connor’s chosen doors had experienced in their past lives, as seen in suspended animation (such as where sullied hands cumulatively left their mark in instances of worn-o paint or accumulated grime). With such minute attention to detail, Connor’s work offers a verisimilitude so precise that it could easily be mistaken for the real thing, which begs the question: why laboriously recreate an object that could simply be appropriated? Unlike Danh Vo or Cameron Rowland, two artists whose use of the readymade foregrounds the compelling personal and political histories of their chosen objects, Connor’s work is a deft repetition of the real. Indeed, her readymade-once-removed production is a fiction residing in tandem with reality—meaning we are meant to understand that her work is a facsimile of lived experience at a particular place and time. With this, Connor mobilizes the deceptive surface of artifice not only to underscore the often-overlooked aesthetic qualities of quotidian objects, but also what they communicate about the societies in which they function. Lucy Skaer’s exhibition The Green Man is an exploration and reanimation of the desire to collect. Throughout her practice, Skaer mines and manipulates pre-existing imagery—from art, history, and from her own oeuvre and personal history—transforming and destabilizing relationships between materials and meanings. For this exhibition, Skaer has selected items from the collections of the University of Edinburgh and invited fellow artists to inhabit the galleries of Talbot Rice alongside her—Fiona Connor, H.D., Will Holder, Nashashibi/Skaer and Hanneline Visnes. By calling the exhibition The Green Man, Lucy Skaer is likening the animation of collections, and the spontaneous generation of form in her artwork Sticks and Stones, to the symbol of renewal to be found in figures made of leaves and vines. Present in both pagan and Church imagery, the Green Man made a resurgence after the plague, when wilderness and weeds took over the arable land. From the anthropomorphic sculptures in her recent work La Chasse, to the evolution of materials and forms we find in Sticks and Stones, Lucy Skaer will be weaving the authority of natural materials and forms throughout the exhibition. The Green Man will include new works commissioned by Talbot Rice Gallery for the exhibition, providing playful new ways for the collections of the University to speak to visitors. Hopkinson Mossman is pleased to present Closed Down Clubs & Monochromes, a solo exhibition of new work by Fiona Connor, and the inaugural exhibition in the Wellington gallery program. Fiona Connor uses strategies of repetition to produce objects that interrogate their own form and the contexts in which they are encountered. Reconstructing a public drinking fountain, a kitchen wall, a notice board from the local café or brick production plant, her work engages different vernacular architectural histories embedded within our built environment. Closed Down Clubs & Monochromes comprises two distinct bodies of work that, while materially divergent, both interrogate the material and temporal course of an object’s ontological existence. Artists: Mathieu Kleyebe Abonnenc (b. 1977); Lutz Bacher; Darren Bader (b. 1978); Fayçal Baghriche (b. 1972); Kasper Bosmans (b. 1990); Carol Bove (b. 1971); Andrea Büttner (b. 1972); Banu Cennetoğlu (b. 1970); Jay Chung and Q Takeki Maeda (b. 1976; 1977); Fiona Connor (b. 1981); Isabelle Cornaro (b. 1974); Martin Creed (b. 1968) ; Cian Dayrit (b. 1989); Jason Dodge (b. 1969); Latifa Echakhch (b. 1974); Haris Epaminonda (b. 1980); Geoffrey Farmer (b. 1967); Lara Favaretto (b. 1973); Ceal Floyer (b. 1968); Ryan Gander (b. 1976); Mario García Torres (b. 1975); gerlach en koop; Iman Issa (b. 1979); Hassan Khan (b. 1975); Kapwani Kiwanga (b. 1978); Mark Leckey (b. 1964); Klara Lidén (b. 1979); Jill Magid (b. 1973); Dave McKenzie (b. 1977); Shahryar Nashat (b. 1975); Henrik Olesen (b. 1967); Christodoulos Panayiotou (b. 1978); Amalia Pica (b. 1978); Michael Queenland (b. 1970); Willem de Rooij (b. 1969); Miljohn Ruperto (b. 1971); Tino Sehgal (b. 1976); Mungo Thomson (b. 1969); Antonio Vega Macotela (b. 1980); and Danh Vo (b. 1975). 1301PE is pleased to announce the opening of Fiona Connor’s exhibition, Community Notice Board and Monochromes, at Modern Art in London. The exhibition is part of Condo London 2018 and was co-produced by 1301PE and Modern Art. Condo is a collaborative exhibition by 46 galleries across 17 London spaces. Laurel Doody Library Supply was founded to help solve the problems facing artists publishing on a small scale. The project works to distribute these rare and careful publications beyond artists’ social circles, while providing for their long-term safekeeping. Once a year, the project will curate a group of publications and donate full sets to five public archives around the globe. In exchange, these partner archives agree never to deaccession the works, and to tag them as part of the Laurel Doody Library Supply collection: an archive within archives. 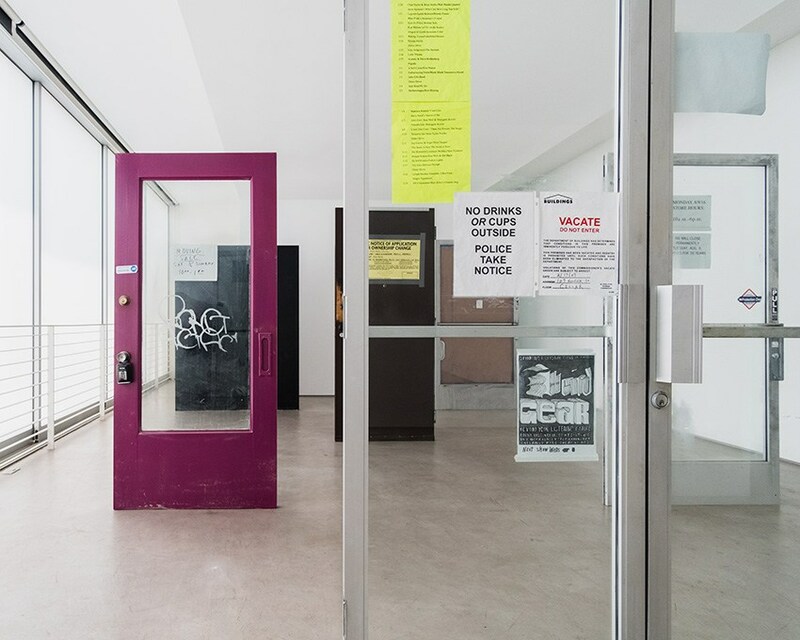 The Library Supply project continues the legacy of Laurel Doody, a project space run out of an apartment in Miracle Mile for twelve months in 2015 – 2016, in hopes of both supporting the practices of those involved and extending these ongoing conversations to a wider, lateral audience. The exhibition will remain on view from 11am to 5pm on October 21, 22, 28, 29, November 4, 5, 11, 12. This year's iteration of High Desert Test Sites is built around An Ephemeral History of High Desert Test Sites: 2002-2015, a month-long exhibition focused on the project's history. In addition, a pseudo-symposium titled The Palm Talks compliments the exhibition with live music and presentations on the topic of non-communities. An Ephemeral History of High Desert Test Sites presents an incomplete and partial look at the organization's fifteen-year history, based on the artifacts, ephemera, and facsimiles that have been recovered by High Desert Test Sites and past participating artists. It has prompted a desire to document the organization's history, to create a living archive of contributions that were otherwise ephemeral and temporary, and to observe the narrative of the gathered material in order to tell the story of the organization, the vast community of artists involved, and the landscape that has witnessed these activities. High Desert Test Sites 2017 is complimented by new projects and contributions by Fiona Connor, Bob Dornberger and Sarah Witt, Neil Doshi, Edie Fake, Glenn-Murray & Co., Oliver Payne, Carolyn Pennypacker Riggs, and Ry Rocklen. Front Door takes its cue from the passageways and thresholds of two spaces: the Chicago Cultural Center and the Chicago Pedway. This Beaux Arts building originally opened in 1897 to house the Chicago Public Library and the Grand Army of the Republic Memorial Hall; it was designed by the Boston-based firm Shepley, Rutan & Coolidge, who were working concurrently on the Art Institute of Chicago (1893–1916). Since a renovation by Holabird & Root from 1974 to 1977, the building has been used as an arts and culture center; in 1991, it was officially established as the Chicago Cultural Center, as it remains today. 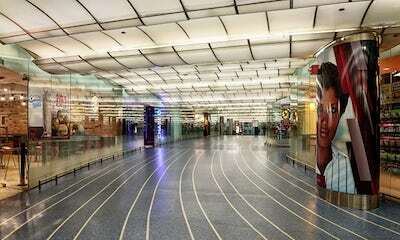 The Chicago Pedway began in 1951 with the construction of two block-long pedestrian tunnels between State Street and Dearborn Street at the Washington and Jackson CTA stops. Since then, the subterranean system has expanded through public and private development to connect more than 50 buildings with public transit stations underground in the downtown area, so far covering roughly five miles altogether (this includes a few street-level and overhead walkways that are part of the mostly underground network). The wide variety of designs and materials that appear in the Pedway demarcates changes in ownership and also functions as a historical index of shifting standards and tastes. This section of the Pedway, situated underneath the Chicago Cultural Center, opened in 1989. The Chicago Cultural Center's main entrance on Randolph Street, contains a cross section of the different types of fluorescent lights that illuminate the underground chambers of the Pedway. The second site of the project can be found one floor below, upon exiting the Chicago Cultural Center and entering the Pedway. For this year’s Chicago Architecture Biennial (until January 2018), Los Angeles architect Erin Besler and artist Fiona Connor are creating installations inspired by the walkways’ textures, fixtures and fittings. Their work will highlight “a bit of functional infrastructure that gets far less attention than the more iconic structures it serves above ground”, said Biennial executive director Todd Palmer. These will be displayed in the Chicago Cultural Center, one on the ground floor and another where its basement joins the Pedway. View of “Ma,” 2016. From left: Fiona Connor, Ma #2 (Bedroom window of John McLaughlin at his home in Dana Point), 2016; Ma #1 (Bedroom window of John McLaughlin at his home in Dana Point), 2016. This perversity of proximity is understated, but prevalent in works by Fiona Connor, who also organized the show. In her Ma #1 (Bedroom window of John McLaughlin at his home in Dana Point) and Ma #2 (Bedroom window of John McLaughlin at his home in Dana Point)(both 2016) Connor inlays fragments of the titular painter’s former Southern California home in the walls of the gallery. These literal intrusions of context into the space of the exhibition complicate the internal harmonies of the abstract McLaughlin artwork they face, #13, 1964, a nearly symmetrical, black-and-white, geometric oil painting. Ma is an exhibition curated by Fiona Connor at Château Shatto, sprung from the artist's encounters with the photographic archives of Frank J. Thomas. For Ma, Connor has composed a group of works that she understands as being nourished by similar concerns that she first responded to in Frank J. Thomas' photographs, more specifically his documentation of the paintings of John McLaughlin. Ma includes works by Judy Fiskin, Sydney de Jong, John McLaughlin, Frank J. Thomas, Audrey Wollen, Bedros Yeretzian and Fiona Connor. The exhibition design has been undertaken by Sebastian Clough. Ma is the culmination of a series of projects by Connor including a display case at the Auckland Art Gallery, a lecture at Elam School of Fine Arts at University of Auckland and an exhibition at Minerva in Sydney, Australia. This exhibition takes Connor's research back to Los Angeles, where it began. Three artists whose work seems both conceptually and materially dissimilar and five press releases with different interpretations can be found here, though the title of Fiona Connor's All the Doors in the Walls, 2016, is to be taken literally. Each door in the gallery was stripped of its function; they no longer serve as mediators or passages from one place to another but as static objects of art, disposed toward admiration for their simplicity. For Brick, Cane and Paint, Connor presents work from three new notice board projects (quoted from three sites: a brick plant and a cane factory in Los Angeles, and a weavers guild in Auckland) alongside a new series titled Insert (Chopping Board). Where previously Connor's work has focused on bulletin boards from public spaces (such as city parks, libraries, community centres etc. ), the sculptures in Brick, Cane and Paint represent activity at specific sites of production, with content generated by a fixed group of individuals. Notice Board (Pacific Clay), the set of six boards in the small and large galleries at Hopkinson Mossman, are quoted from Pacific Clay; a brick plant frequented by the artist. The Pacific Clay boards are punctuated by a single piece from the Handweavers and Spinners Guild in Mt Eden (a community organization close to the artist's childhood home), and the boards that hang in the gallery's office spaces are from Cane and Basket Supply, a workshop near the artist's Los Angeles studio. Routine Pleasures brings together artists working in a variety of media to explore "the termite tendency," a concept introduced by artist and film critic Manny Farber (1917–2008) in his 1962 essay "White Elephant Art vs. Termite Art." Whereas the original essay applied these labels to the work of filmmakers, exhibition organizer Michael Ned Holte finds manifold parallels in contemporary art. In today's overheated art world, it is easy to see a preponderance of "white elephant" art, defined by Farber as "yawning production of overripe technique shrieking with preciosity, fame, ambition." Routine Pleasures presents practitioners who embrace a quieter, more process-oriented approach. Like termites, these artists focus closely on what is before them, and follow the work wherever it may lead, often in diffuse directions. To locate and expand upon Farber's construct of the termite tendency, the exhibition features works by: James Benning; Jennifer Bornstein; Center for Land Use Interpretation; Harry Dodge; Manny Farber; Judy Fiskin; Magdalena Suarez Frimkess and Michael Frimkess; Galería Perdida; Sarah Lehrer-Graiwer; Simon Leung; Lucky Dragons; Roy McMakin; Carter Mull; Newspaper Reading Club; Pauline Oliveros; and Steve Roden.